Cool! 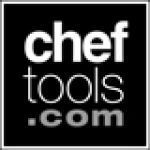 Save an average of 20% on ChefTools.com with 7 Coupon Codes, and 14 Deals! Quality kitchenware, kitchen utensils & cooking tools, bakeware & cookware for chefs & cooks, videos, recipes, reviews, ratings & tips. free shipping on orders $125 and up. Details: Free shipping on orders $125 and up. Details: $2.79 Flat Rate Standard Shipping. Ends 9/31/2012. Free shipping on orders $99+. $10.99 off order of $70 that includes at least one "talisman designs" item. Details: $10.99 off order of $70 that includes at least one "Talisman Designs" item. Details: Free Shipping on Orders over $99+. Exclusions apply.See merchant’s site for details.